The Cascadia Initiative Deployment Plan was developed by an NSF-supported community workshop held in Portland, Oregon in October, 2010. The workshop produced a series of recommendations to maximize the scientific return of the CI. The full workshop report can be found at CI Workshop Reports. This page provides links to maps and data files for the Deployment Plan and outlines the procedure that CIET will follow when making significant changes to the deployment plan. 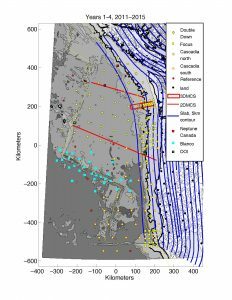 The preliminary deployment plan developed at the 2010 Portland meeting will require modifications in order to take into account, for example, instrument availability, seafloor bathymetry and possible geo/bio-hazards (e.g., trawling, turbidity currents, etc.). When circumstances, eg instrument availability, demand a change to the CI deployment plan, the CIET develops a new plan that remains as close to the original community plan as possible but accommodates the new circumstances. This plan is made available to community members with specific knowledge or interest relevant to the change for comment and suggestions. The CIET revises the plan accordingly and presents it to AASC (Amphibious Array Steering Committee). The AASC reviews the plan, makes suggestions/changes, and approves the modified plan. The modified plan is posted on the CIET website, at which point community wide input is welcome, within a time frame that is practical for reconsidering the design. This procedure was discussed on by AASC on May 26, 2011 and approved. Above are links to two documents on Cascadia trawling from Andrew Barclay. 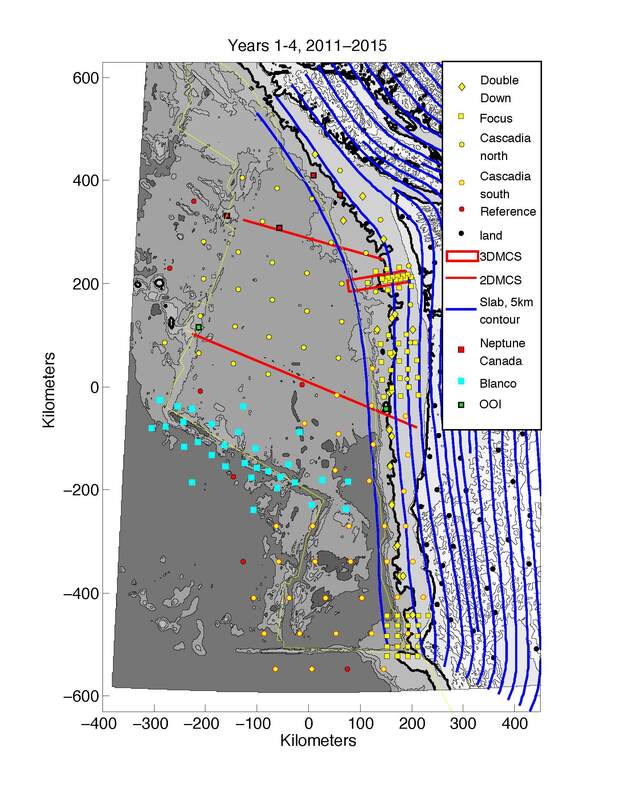 The first (Cascadia_OBS_and_trawling.pdf) is Andrew’s detailed summary of the issues and possible solutions based on his discussions last October with Scott McMullen of the Oregon Fishermen’s Cable Commission (OFCC) and Walt Waldorf (OSU). The second (trawl_report_2010.pdf) is a formal NOAA fisheries summary of 2010 trawling in the area. I plan to contact Scott McMullen to establish a dialogue on the experiment and hopefully find out where known trawling hangs are in the area of interest for Cruise 1 (mostly the FA). Leaders of Cruise 2 & 3 should probably do likewise for their sites, or perhaps we should discuss a more coordinated approach? If so, Anne is the logical person to do the contacting (but I believe she’s out of the country for another week or two).